Sometimes people ask me about my favorite blogs. These are a few of my favorites. I’m sure I’m missing others that I frequent so often I don’t even recall visiting them daily. One of these blogs, SEOmoz, recently had a post from founder Rand Fishkin. The topic was very interesting. It’s not a new topic, but if Rand is discussing it then the industry will likely start taking more notice. So I thought I better chime in with my interpretation of the subject. The topic is buying blogs and Rand’s article highlighted the success businesses potential could have by yielding this option. The blog post from Rand came out of frustration with link buying, a common trick used to game the SEO system. For those in the SEO world that play by rules and ethics, link buying has been a thorn in the side. Rand is very passionate about the subject. Knowing this I was very interested to see Rand’s take on potentially purchasing blogs. I see a huge disconnect between those who are naturally earning all the signals engines say they want (blogs and online communities) vs. those need them (commercial sites) and no reason the two can’t co-mingle. If you’re a marketer looking to invest dollars into earning a presence in the search, social and web world, you can either build it yourself or you can buy it. I hope to see lots of dollars flowing to the content pioneers who’ve already proven themselves effective earners of inbound marketing signals — the bloggers. Please read the entire blog post for full context. There is great insight very much worth your time. The future of your company could depend on understanding this concept. Notice: Rand is not talking about doing anything considered wrong or even in the gray area. He is talking about purchasing a blog, as a company, and further improving the content and community. There are surely some that will buy blogs and other properties strictly for link buying purposes and even social proof purposes. Those companies can “win” in the short-term, but it’s not a long-term strategy. The smart companies will follow Rand’s advice and really work to develop community around their blog. This is something much more valuable than rankings. Having a community of subscribers and followers is actually something Google or anyone else can never take away from you. There is one example I thought of right away when it comes to companies – were talking large brands – buying blogs and successfully profiting from the community. That example is ProFootballTalk and their relationship with NBC. The owner of ProFootballTalk, Mike Florio, started the blog as a way for NFL enthusiasts to keep up with all the information in the pro football world. His blogging strategy is a tireless one. He has writers that are constantly in tune with everything going on in the football world. Even NFL owners use his blog to keep tabs on what is happening. Sometime about 7 or 10 years ago, the blog was purchased by NBC and NBC Sports. The blog stayed the same. The location of the blog changed and NBC became the supporting brand. The blog has continued to grow and be successful. Florio and his team have kept the same strategies in place, but NBC has been able to provide their resources to make the blog even more valuable to the community. Florio is now on an NFL talk show. This past season was the biggest of all time for the blog. NBC has gained a huge source of traffic, but even more important they have gained what is perhaps the biggest online community of football enthusiasts right on their own property. The posts are shared all over the social graph. Posts are always near the top of Google and Google News. 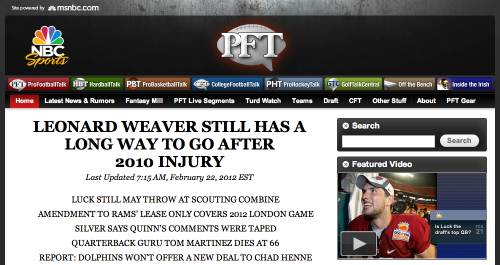 The site is huge and both NBC and ProFootballTalk have benefitted from the partnership. I’m sure there are hundreds of other examples of this partnership in action. Buying blogs is certainly a good strategy. As Rand says, you can either buy a blog or build your own. It’s the way companies can really succeed in the future.